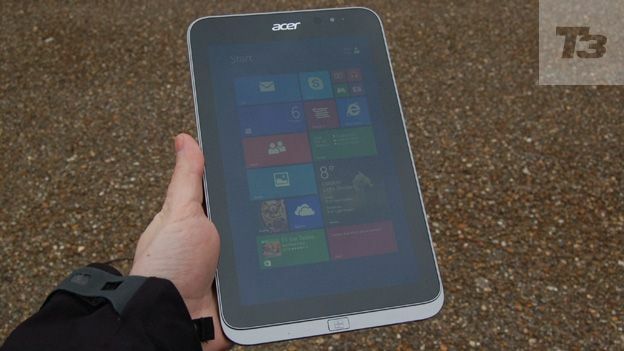 Is the Acer Iconia W4 Windows 8 tablet a worthy iPad rival? If you're thinking the Acer Iconia W4 looks familiar, you'd be right. It's basically an upgraded version of the Acer Iconia W3, with a better screen, nippier processor, and now with Windows 8.1, the latest version of Microsoft's operating system. Like the Microsoft Surface Pro 2, there's also an optional keyboard so you can use it like a laptop, though we didn't get our hands on it for this review. Like the Iconia W3, the Acer Iconia W4 is an 8.1-inch device, which, Acer claims, is compact enough to hold in one hand. Which is true, but it's too big to use with one hand. The Acer Iconia W4's full dimensions are: 10.75x134.6x218.4mm - that's a full 3 inches fatter than the Apple iPad mini 2. The Acer Iconia W4 weighs 415g, which is less than half the weight of the Microsoft Surface Pro and Microsoft Surface Pro 2, and less than the iPad Air, though it is heavier than the slightly smaller iPad mini 2. You'll notice it in a pocket, but it won't weigh down your bag too much. Acer has also given it a lick of paint - it's black with a grey back, whereas the Acer Iconia W3 was black with a white rear. Windows 8.1 is the order of the day, which means faster performance compared to Windows 8. Windows 8.1 also adds new features like multi-tasking and multi-monitor support, better apps, and a search option that brings together results from your tablet, cloud storage, and the web. You can give your most-used apps bigger tile sizes, and of course the Start button makes a return. In terms of connections, the Acer Iconia W4 has ports for micro-USB and micro HDMI, plus a microSD card slot for expanding the 32GB on-board flash memory. The screen is very slightly bigger than the iPad mini 2's, and it's a definite improvement over that on the Acer Iconia W3. It's an 8.1-inch Active Matrix TFT Colour LCD, with a resolution of 1,280 x 800 pixels, which gives it a pixel-per-inch rating of 186ppi. But it's not fantastic. Colours appeared a little washed-out, nowhere near as vibrant as on the Microsoft Surface Pro 2, or the Google Nexus 7. Dark areas in videos were particularly murky and indistinct. It also struggled to keep up with a high-speed chase on Top Gear, with a little ghosting following the cars and motorbikes. The screen is a bit frustrating to use as well. It's fine prodding the tiles of Windows 8.1, and they respond very quickly, but in Microsoft's Explorer web browser the buttons and links appear so small it's easy to mispress. Which means you end up stabbing repeatedly, hoping you'll hit it. Not ideal. But the viewing angles are a big improvement over the Acer Iconia W3. On the back of the Acer Iconia W4 is a 5-megapixel camera with autofocus that supports video recording up to 1080p. And it's surprisingly good for a tablet camera. The liver spots on tree branches came out with plenty of detail, though grass wasn't as green as in pictures we snapped using the Sony QX100 camera add-on for smart phones. A neat feature lets you choose from 15 pictures once you've pressed the shutter as well - seven before you snapped, and seven after. Which is great for action shots, or if someone blinked during a group shot. Video footage was a bit grainy in less-well-lit areas, but nice and sharp when the sun was out, and it all ran smoothly. Inside is a quad-core Intel Atom processor, clocked at 1.33GHz. That's pretty low, considering the likes of the Samsung Galaxy Note 3 has a 2.3GHz chip inside. But it's fine for general day-to-day use, such as flicking your way around the Windows 8.1 UI. Videos ran without a hitch, and games ran fine too. It handled the more frantic sections of Dungeon Hunter 4 without any problems, and no noticeable slowdown. But it's worth bearing in mind that as developers make more graphically advanced games, and take advantage of emerging technologies, you might find your Acer Iconia W4 struggling pretty soon. If it's a future-proofed tablet you're after, this isn't it. Acer claims you'll get eight hours video playback from the Acer Iconia W4 4960mAh battery, and from our test, that seemed to be the case. After a day's pretty intensive use, including watching video, web surfing, and emailing, the battery gave up the ghost at about 6pm.